Hi friends! I wanted to start doing more camera gear reviews on my blog this year as I get so many gear related questions everyday. What better camera to start with than the Fujifilm X-Pro2! The very first camera I ever owned was it's predecessor - the Fujifilm X-Pro1. Maybe it's just me, but I have strong sentiments and fond memories of my first camera. There was something about the X-Pro1. It had so much style and soul - something that most modern cameras are lack these days. If you're expecting a technical, pixel peeping review, this post isn't for you. I'm already late to that party as this camera was released a while ago. Also, let's be honest, most cameras that are out today are good enough to the point that pixel peeping is rather pointless. Instead, I wanted to write a more personal gear review, sharing my personal thoughts and experiences with it. I feel it's the little quirks and lesser known user experiences that really define the usability of a camera these days. I won't bore you too much with the specs of the X-Pro2. Just know this, it is as capable as any other mid to high range camera on the market right now - mirrorless or DSLR. There is no perfect camera for each individual - it all comes down to your own use case and what your priorities are. Better low-light performance. (It is comparable and on par with some full frame cameras I've used). Increased Megapixels (from 16MP to the current 24MP). Redesigned button layout on the back of the camera for better one-handed use. More button customisations, including a joystick for quicker autofocus selection. (This was rad). A new swanky film camera throwback ISO dial (see photo). *Not entirely convinced or sold on this new switch. Improved OVF/EVF viewfinder plus a small focusing window that pops up in the OVF (see video). *The list of changes and updated features and specs go on. Click here for full list of specs. All in all, the new features although not particularlyground breaking, were much needed to modernise the Fujifilm X-Pro line. Now that that's out of the way, let's move onto my actual experiences and thoughts of the X-Pro2. I challenge you! In my personal opinion, there aren't many better looking cameras out in the market right now. The strong retro styling is reminiscent of an exponentially more expensive brand of camera that shall not be named (German brand, rhymes with diaper). I'm ok with that. In fact, I like that Fujifilm had the sense to bring that type of design to a more affordable camera. One that is equally as capable. It's a pretty simple philosophy. Make a good looking products, and people will want to use it more! They will be more inclined to bring it with them and be seen in public with it, almost as if it were a fashion accessory. Full disclosure: I bought my first camera - the X-Pro1 because it looked cool. I barely read the spec sheet. That then led me on the path to actually wanting to learn how to use it. Fast forward 2 years and I now make a living from photography. Fujifilm have recognised this and have kept the design of the X-Pro2 almost exactly the same as it's predecessor. The only real give away between the two models is a square autofocus light (X-Pro2) vs the circular one on the X-Pro1. It seems Fujifilm has listened to it's customers and have kept the body unchanged - a rare trait for camera companies today. It's sleek and understated design then leads me onto my next point. One of my favourite things about the X-Pro2 is how stealthy and inconspicuous it is. It's small, sleek and black body does little to attract unwanted attention. This is an invaluable trait for any camera. People are increasingly wary about photographers these days, with some people who get irrationally angry about people taking their photo. I think this is what makes the Fujifilm X-Pro2 so perfect, specifically for candid photography - be it street, event or even wedding photography. People tend not to notice you with the X-Pro2, or to the very least, they aren't as intimidated. It's smaller size in comparison to the larger DSLR's gives off the impression that you're a casual type shooter - a traveller maybe with less ill / commercial intent. It also means that it is lighter and more compact to carry around. I paired the X-Pro2 with the XF35mmF2.0 and it was amazing! I have forgotten what it's like to move around with a more compact camera. The OVF (Optical Viewfinder) and EVF (Electronic Viewfinder) combo is probably the X-Pro2's biggest differentiator between all other cameras - Fujifilm or otherwise. It is pretty neat. It essentially gives you the best of both mirrorless camera and DSLR worlds. OVF which is essentially a optically clear, glass viewfinder with information overlaid onto it. It is comparable to what DSLR users see (with the exception of the rangefinder parallax). Great for seeing the world in natural world in real-time - just as how your eyes would see it. It also has it's benefits when shooting in bright conditions. EVF which is an electronic viewfinder screen that slides out over the OVF. The EVF is comparable to the mirrorless camera experience. It's great when shooting in low light and for a what-you-see-is-what-you-get exposure preview. Electronic Rangefinder (hybrid), in this mode, you're essentially in the OVF mode, where a tiny electronic screen pops out on the bottom right hand corner which enlarges what your focus point is on. If you had trouble understanding my explanation (sorry!) check this video. The ability to switch between two modes definitely has it's uses, but I feel these uses are unique / specialty type uses for certain types of photographers. More on this at the end of the review. Here are some sample images & videos I created over the two week period that I had the camera. All the photos below were shot with the Fujifilm X-Pro2, with either the XF35mmF2.0 or the XF16-55mmF2.8. The upgraded megapixel count from 16MP to 24MP means you can crop in pretty heavily and still be fine. This gives you more creative freedom to recompose images in post and is much more forgiving! Check the two photos below. I've cropped in pretty heavily and the quality is still great. 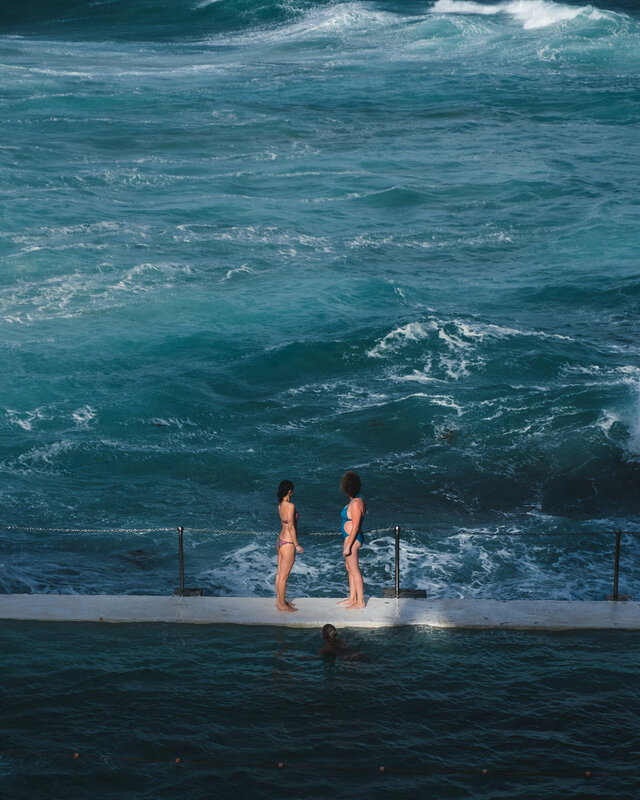 Below are some "nature" shots I took at the world famous Bondi Icebergs Pool. 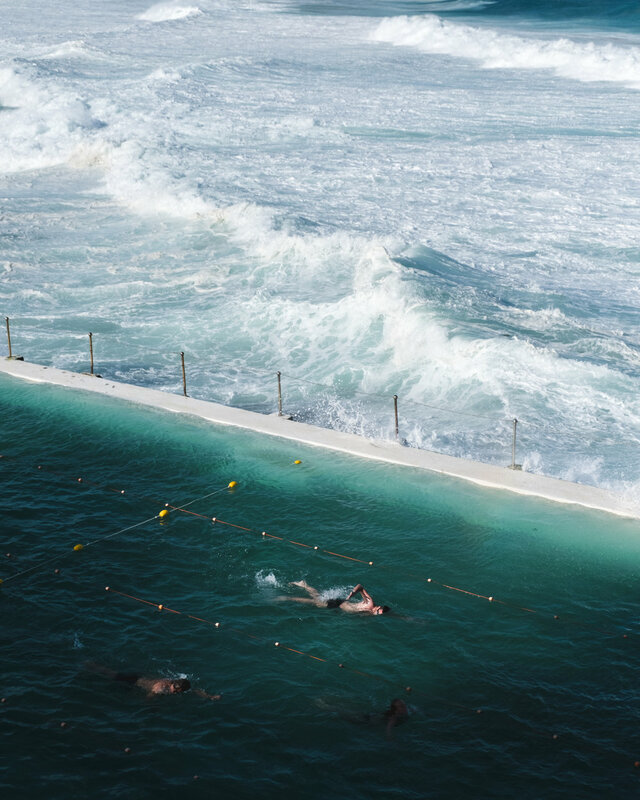 The 8fps burst mode definitely came in handy when shooting the action sequence of the pool goers playing with the crashing waves. I really like the Fujifilm X-Pro2. I thoroughly enjoyed shooting with it. It reminds me of my first camera and brought back fond memories, but with non of the former X-Pro1's annoyances. With it's latest refresh, it is definitely a candidate for a professionals main (workhorse) camera. It's biggest selling point and product differentiator is it's the OVF/EVF feature, and I'm not sure I need that. The OVF is great for street photography, but can get a little annoying when using a larger lens as the lens blocks your vision. The EVF is great, and how it slides out is cool at first. Everyone I showed it to was wow'd but I'd imagine that party trick gets old pretty quickly. I'm not sure I can justify paying a premium just for that feature right now. It's not something that I prioritise very highly, especially when Fujifilm's newer X-T2 is such a close (and slightly cheaper) option. The lure of the Fujifilm X-T2 is made even stronger by the fact that it has more video features, something that I getting more involved with these days. Would I buy one right now? Probably not. It is a great camera that is very capable and looks cool as hell, but it also fills a specialty niche that I'm currently not in. Cost doesn't justify it's OVF/EVF specialty. Film style ISO dial is gimmicky at best (not convinced yet).